Hello all you great people of CBRforum! So, I am currently building a custom CB750, where I am using a CBR1000F front end. Yesterday I managed to get some work done, and got the stock fork off and test fitted the new CBR1000F. It looks great, and the geometry is close enough so that I will be able to get good rideability. However, I need to make a custom top triple for it. As I didn't get one when I purchased the forks, I was wondering if anyone here got the measurements (mainly the three c.t.c). If there's any interest I can upload the finished CAD so anyone can modify it to fit their projects. Throw up some pics of that project though! The idea already struck me, but the problem is that I do not have anything fancier than digital calipers or micrometers, which doesn't give me the precision that I would like. Even a few millimeters off will bend the legs ever so slightly, which will increase the forces exponentially. If it makes much of a difference or not I do not know, but I would like to see if I can get the precise measurements before I try to measure it myself. I am just getting to the interesting bit (rebuilding) so it will hopefully get more interesting as the build progresses. Thanks for the reply by you as well! I could do it like this, but there are two apparent problems that I face. First of all I only have one point of fixture of the legs, which means that I most likely do not have them precisely straight. I could mimick the lower triple (which I have) but as I do not know if the top is identical to the lower triple that isn't a perfect idea either. 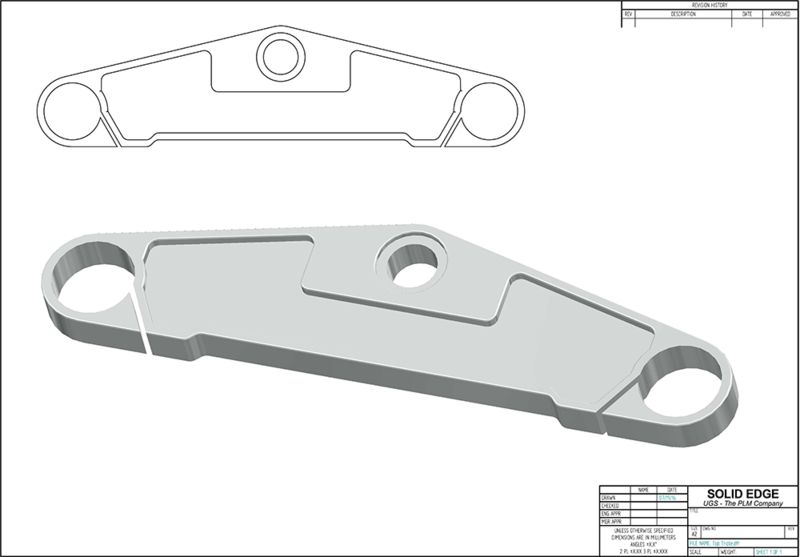 Just a thought, if you done the mound scenario it could then actually be scanned directly into a cad program by the engineering shop then pretty it up or personalise it however you want prior to milling. I made a quick drawing of how I kind of want it to look, design isn't completely finalized and it's rough around the edges (and obviously the measurements are just out of my ***, so the relations aren't 100%). But at least it gives me somewhat of an idea of what I want to do. I didn't bother with putting any holes in, but I was planning of making the tach mount point in the square around the steering stem. Last edited by cb750tr; 07-19-2016 at 04:02 PM. It's great to see and watch these builds take shape. The ones we are doing we are building in what I call soft form and it's really just assembling the bikes to a point we like what they look like, which sees a lot of changes upon changes then we will again pull the bikes apart and at that stage take off any unwanted previous mounting points etc then paint frames etc once we are happy with the build. Saves getting to the end of it and thinking oh we should of done this or that.